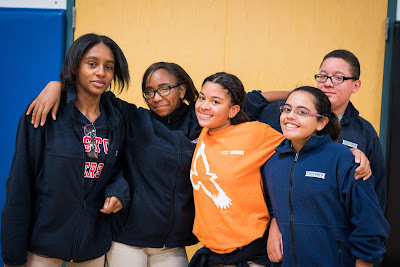 The following is a guest post by Katie Yezzi, Founding Principal and Senior Principal of Troy Preparatory Charter School in Troy, New York, part of the Uncommon Schools network of urban public charter schools. Troy Prep currently has an elementary school and a middle school; a high school is scheduled to launch in fall 2017. I’ve worked in schools for nearly my entire career of over 20 years. The reason I got into it, and the main reason I come back to it each day and each year is that I find the learning process to be bordering on miraculous, and I love kids. I think that’s why I ultimately have come to found the school that I have – a “no excuses” charter school where compassion and love for kids is the driving force. I want our students to know they are loved, and to know that we show our love through hugs and smiles, but also through challenging math problems. Our student population consists of approximately 63% African American, 15% Hispanic, and 15% Caucasian students. The majority of our students' parents did not attend university. The majority also live below the poverty line. While my love can’t make their life challenges and struggles go away, giving them a safe space and moments where they can be quiet, calm and mindful can help them learn how to keep those difficulties from being obstacles. In the U. S., a charter school is a tuition-free public school with a particular mission. 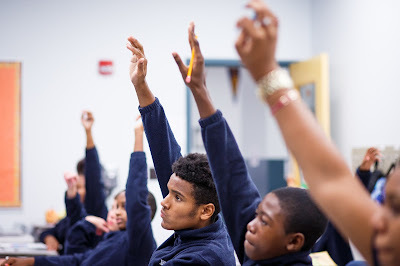 The mission of Troy Prep is to prepare all students to enter and succeed in college through effort, achievement, and the content of their character. While the specific ways we do things is based on our unique mission and student population, the same basic principles can apply to schools anywhere in the world. We can’t control every aspect of our students’ lives, but we can control much more of the school environment than a lot of people realize, and we can do it in a way that supports kids, parents, teachers, and staff. 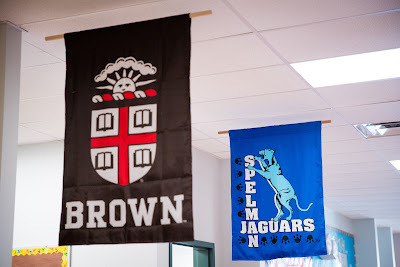 At Uncommon Schools, we refer to our students as ‘scholars,’ and each homeroom class is named after a particular college or university. This isn’t a gimmick; it’s a daily reminder of the school mission to prepare all of the children to eventually attend and succeed in university. Beginning on the very first day of kindergarten, we’re showing everyone (kids, parents, and staff) that we believe our students are capable of higher learning. This is significant because it isn’t a natural assumption, the way it would be at an elite private school where most of the parents are college educated. Troy Prep draws from the same student population as the local public schools, but our students outperform their peers on state-wide tests. This means that under the right conditions, these kids are capable of succeeding in school. We’re proud of our results on state-wide tests, but the purpose of testing isn’t just to rank students. It’s to see which parts of the unit they have or haven’t mastered, and where they might need additional help. Have we taught the lessons successfully? What worked, and why? Where do we still need to support the kids in order for them to be ready for the next grade level? 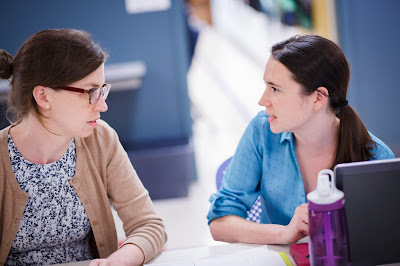 In the lower grades we call our tests “show what you know” because really, that is what we want from them – to show us what they know, so we can re-teach what they have missed and figure out what type of support they need to succeed in their classes. In addition to doing their best academically, students at Troy Prep are expected to demonstrate the core virtues of diligence, integrity, responsibility, compassion, perseverance, and respect in everything they do. They adhere to a strict but supportive daily regimen that makes respectful treatment of one's teachers and peers non-negotiable. Students also learn from an ethics curriculum that will help them use their knowledge and skills to do what is right. Of course, our kids can still face bullying outside of school, but we do everything possible to make the school itself a safe place for every student. providing breakfast, lunch, and a healthy snack to every student every day. Classes move through the hallways single file, supervised by teachers, as they quickly and quietly transition from one activity to the next. providing clear, consistent consequences for disruptive and disrespectful behavior. 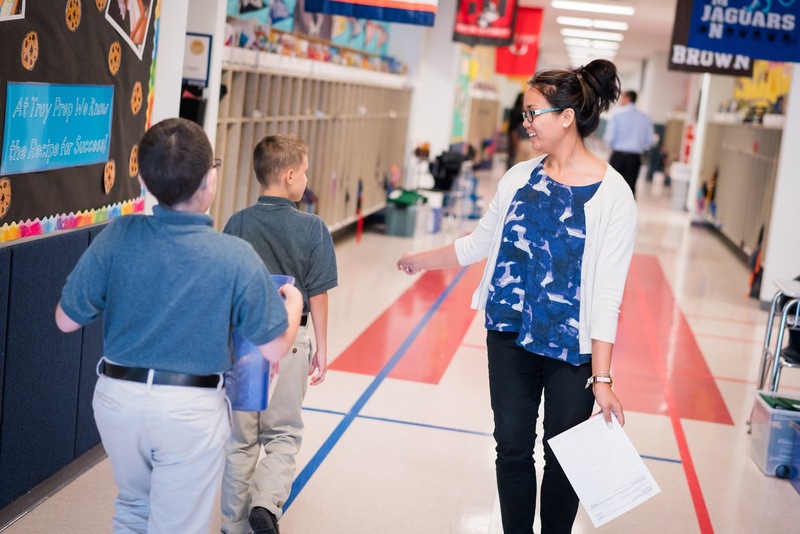 Kids will be kids, and while we hold the expectation of exemplary behavior, we also plan for how to respond when they don’t meet those expectations. The point of discipline is for them to understand what is and isn’t tolerated and to learn to regulate their own behavior. In fact, we talk about discipline as first of all, teaching students the right way to do things. Then we use a management system to give them feedback to teach them about the natural consequences of how they conduct themselves and the choices they make. This system (a card system in the elementary system and a token economy in the middle school) provides incremental positive and negative consequences when students miss the mark, and gives many opportunities for students to succeed, even if not initially. At Troy Prep, students are only sent out of class when they're being disruptive. And when that happens, our goal is to get them right back in as soon as possible by supporting them to calm their minds and bodies enough to focus on the lesson and not distract their classmates. Harsh methods of punishment can actually increase disruptive behavior because they promote an ‘us vs. them’ environment where kids feel like they’re always in opposition to the adults. We don’t tolerate disruption or disrespect, but we want kids to know that we care about them and our goal is for them to succeed. At Troy Prep, we give our students Scholar Dollars, which they can redeem at the school ‘store’ or at an auction of special field trips. Most of them don’t have big allowances (pocket money), so it’s a real treat for them to be able to buy their own notebook, pen, or hair ribbon. And those with the most ‘dollars’ can bid on the most exciting and popular outings. 1) We’re teaching them about responsibility and consequences. Their job is to be scholars and they’re earning a salary, plus bonuses for exceptional work. When they take on “jobs” (such as helping a teacher, or managing materials in their class) in the school, they get an additional paycheck. 2) The field trips provide them with cultural opportunities that most of them wouldn’t have access to otherwise. 'Scholar dollars' might not be a system that works for all schools, but at Troy Prep they’re one successful component of an integrated approach to character development and academic success. Our policies on healthy food and movement are another way that we make our school a safe space for kids. We want to contribute to their building habits for physical health rather than keeping them sitting for hours in the same position and turning a blind eye as they consume sugar and empty calories. We start every day by quietly and mindfully eating a healthy breakfast. This gives everyone an opportunity to set an intention for the day and to be more present in school. We don’t have any vending machines with unhealthy snacks and beverages. In fact, we set guidelines for what food students may bring into the building, not allowing for chips, candy or soda. We provide short physical activity breaks between classes. Because many of our scholars’ parents work evenings, it can be difficult for them to attend a parents’ night or specific day for meetings with their child’s teachers. Additionally, for some of our parents, school is not a place where they feel comfortable or where in the past they have felt welcomed. are welcome to visit their child’s classroom at any time. Everyone benefits when parents feel respected and part of the team that’s supporting their child at school. We have a demanding schedule for our teachers, with an extended school day and extended school year, plus required daily lesson plans that fit with Uncommon Schools’ standard curriculum. They are also required to spend at least two hours a week tutoring students who need extra help. It’s a challenging place to work, so it’s essential that teachers are supported. Students are dismissed early on Friday afternoons to give the teachers an opportunity for professional development. 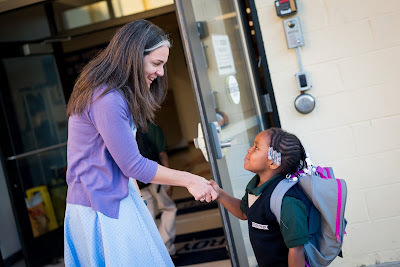 Teachers have a class period every day set aside for meeting with their cohorts. There is regular coaching from instructional coaches and leaders, and an abundance of support networks. We offer a weekly yoga class for our teachers after school to de-stress and re-center. High standards don’t have to come at a high personal cost. Our principals take many of the vacations that our students take, and we encourage our staff to do the same. Sometimes we might catch up on work during part of the time, but over every extended break, we strongly encourage all of our staff to completely unplug and do things for themselves. I spend time with my family, turn off my email notifications, read, knit, go to the gym, clean out closets, travel – all things that help me declutter my brain and make me better at my job when I return. In a challenging school environment, it’s important for everyone to feel respected and supported. A compassionate approach to school leadership addresses the needs of the kids and the adults, so that everyone can do their best. I work hard every day in the hopes of being this kind of leader for our teachers, families and scholars, and I encourage other principals and administrators to do the same.